The Indian State may be a modern entity, claiming to be governed by a liberal-secular constitution, but the mindset of its rulers is frozen in the feudal and colonial past. One glaring example is that of bestowing awards or sinecures to its favourites which was common practice with the feudal lords and the British masters when they ruled India. They regularly awarded their henchmen/women with titles like Amir, Rai Bahadur, Salar Jung, Jang Bahadur, Counsellor of the Empress, Khan Bahadur, Grand Knight of Star of India, Sir and hundreds others. The British masters ‘honoured’ Indian rulers or princes of states like Gwalior, Patiala, Nabha, Kapurthala, Pataudi, Jaipur, Jodhpur, Nizam, Bhopal etc. with many of these titles for helping the former in crushing the 1857 War of Independence. The Indian Constituent Assembly conscious of this evil of the pre-independence rulers’ culture to patronize anti-people/nation personalities abolished award of titles under Article 18, which read, “No title, not being a military or academic distinction, shall be conferred by the State…” There were to be no exceptions. It was strictly followed till 1954 when these were introduced from the back door under the heading ‘civilian awards’ which Constitution of India prohibited in clear words. It became a happy hunting ground for favourites of the Indian rulers. The only exception was 4th PM, Morarji Desai who during his stint as PM (1977-80) suspended conferment of such awards on the ground that the “availability of such titles led people to flatter those in power and harmed both government and society a great deal.” The irony was that Desai was awarded Bharat Ratn posthumously! However, Desai was not off the mark. In a democratic polity where ever person enjoyed the same status, conferment of these civilian titles only showed the rampaging darbari culture to honour those who were part of the kitchen cabinets or in good books of the ruling party, family or alliance. There have been allegations that awards were secured through lobbying, manipulation and even bought. It was not Congress rulers only who indulged in such favouritism. This evil continued with a semblance of transparency, care was taken not to honour people with sectarian and questionable past. With RSS/BJP government headed by PM Modi in 2014 these precautions were abandoned. “He [Nana Deshmukh] personifies humility, compassion, and service to the downtrodden. He is a Bharat Ratna in the truest sense”. “Pranab da is an outstanding statesman of our times. He has served the nation selflessly and tirelessly for decades, leaving a strong imprint on the nation’s growth trajectory. His wisdom and intellect have few parallels. Delighted that he has been conferred the Bharat Ratna”. Nana Deshmukh (his proper name) is not alive to thank Modi’s government but Pranab Mukherjee lavishly thanked the government for this award. Let us compare the above justifications with the actual facts of history in connection with these two Bharat Ratns. According to PM, Deshmukh was conferred this award because he personified humility, compassion, and service to the downtrodden. This is neither honest nor complete description of Deshmukh’s ‘contributions’. 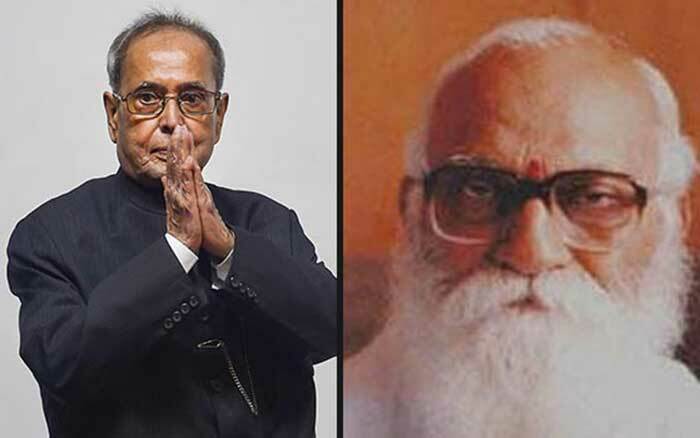 He remained a paracharak (whole-timer) of the RSS throughout his life, remained committed to Hindutva politics which aimed at converting India into a Hindu State where Manusmriti would prevail as the law of the land reducing shudras and Hindu women to a sub-human status. So far as compassion is concerned he justified 1984 massacre of Sikhs by circulating a document ‘MOMENTS OF SOUL SEARCHING’ on November 8, 1984, when the carnage was on. Nana Deshmukh in this document outlined the majoritarian justification of the massacre of the Sikh community in 1984. The massacre of Sikhs was not the handiwork of any group or anti-social elements but the result of a genuine feeling of anger. Deshmukh did not distinguish the action of the two security personnel of Indira Gandhi, who happened to be Sikhs, from that of the whole Sikh community. According to his document the killers of Indira Gandhi were working under some kind of mandate of their community. Sikhs themselves invited these attacks, thus advancing the Congress theory of justifying the massacre of the Sikhs. He glorified the Operation Blue Star and described any opposition to it as anti-national. When Sikhs were being killed in thousands he was warning the country of Sikh extremism, thus offering ideological defense of those killings. Sikh community as a whole was responsible for violence in Punjab. Sikhs should have done nothing in self-defence but showed patience and tolerance against the killer mobs. These were Sikh intellectuals and not killer mobs which were responsible for the massacre. They had turned Sikhs into a militant community, cutting them off from their Hindu roots, thus inviting attacks from the nationalist Indians. Moreover, he treated all Sikhs as part of the same gang and described attacks on them as a reaction of the nationalist Hindus. He described Indira Gandhi as the only leader who could keep the country united and assassination of such a great leader such killings could not be avoided. 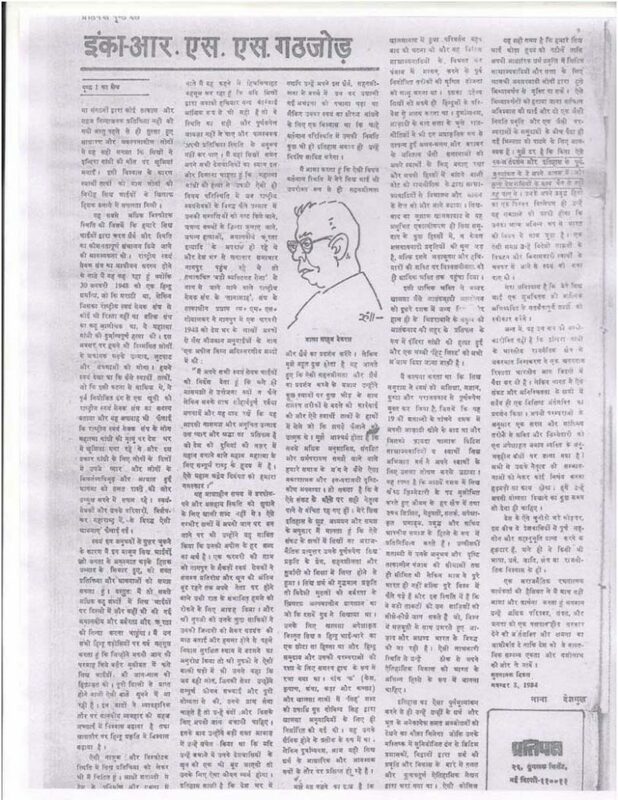 Rajiv Gandhi who succeeded Mrs. Gandhi as the PM and justified the nation-wide killings of Sikhs by saying, “When a huge tree falls there are always tremors felt”, was lauded and blessed by Nana Deshmukh at the end of the document. Shockingly, the massacre of Sikhs was being equated with the attacks on the RSS cadres after the killing of Gandhiji and we find Deshmukh advising Sikhs to suffer silently. Everybody knows that the killing of Gandhiji was inspired by the RSS and the Hindutva Ideology whereas the common innocent Sikhs had nothing to do with the murder of Indira Gandhi. 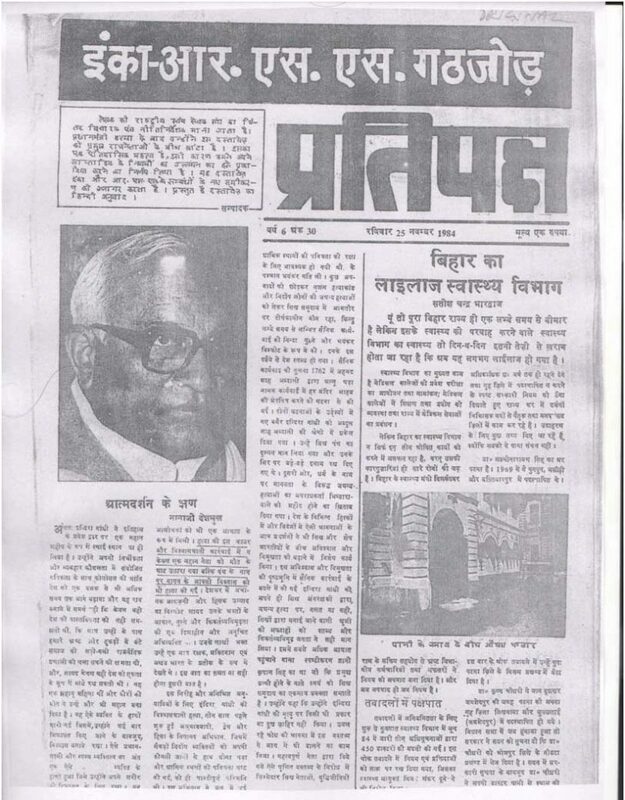 There was not a single sentence in the Deshmukh document demanding, from the then Congress Government at the Centre or the then home minister Narsimha Rao (a Congress leader dear to the RSS who later silently watched demolition of Babri masjid by Hindutva goons as PM of India in 1992) remedial measures for controlling the violence against the minority community. Mind it, that Deshmukh circulated this document on November 8, 1984, and from October 31 to this date Sikhs were left alone to face the killing gangs. In fact November 5-10 was the period when the maximum killings of Sikhs took place. Deshmukh was just not bothered about all this. DD Upadhyay when he was at his prime of career in the RSS and become one of the most prominent ideologues of RSS died a mysterious death. While travelling in a train, his dead body was found at Mughal Sarai junction on February 11, 1968. It was alleged that he was murdered by Communists or Muslim fundamentalists. However, Balraj Madhok, a senior RSS/Jan Sangh leader who preceded Upadhyay as president of Bhartiya Jana Sangh, leveled serious allegations in his autobiography against a few of his old colleagues of RSS/Jana Sangh for conspiring to kill Upadhyay. According to the autobiography, the murder of Upadhyay was planned by those who were kept out of the leading positions of the BJS by Upadhyay as president. It is to be noted here that Upadhyay after taking over presidentship of the BJS from Balraj Madhok in December 1967, had kept out both Atal Bihari Vajpayee and Nana Deshmukh from important posts. The question is whether Nana Deshmukh was awarded Bharat Ratn for these ‘contributions too.’ It is clear that he was conferred highest civilian award for being a Hindutva ideologue. 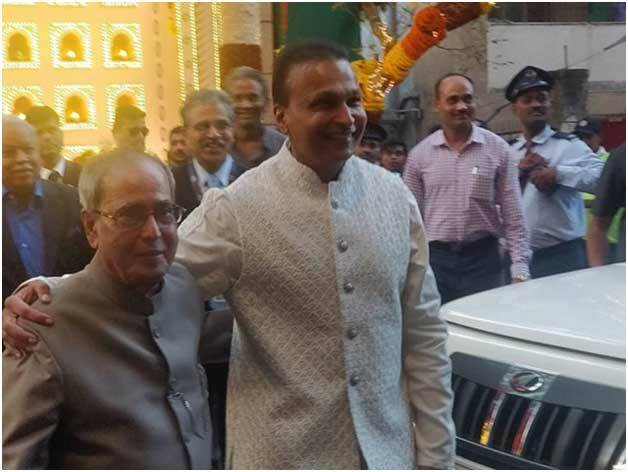 The Bharat Ratn to Pranab Mukherjee materialized due to his joining the Hindutva bandwagon. He had been a leader of the Indian national Congress, theoretically committed to democratic-secular India, for more than four decades, and also occupied the office of the President of India, the highest constitutional office of the country. Interestingly, his election was contested by BJP and its Hindutva allies for being a secular candidate. It needs no reminding that he prospered as a national political leader in the Congress ‘secular’ rule. Before becoming President of India sponsored by Congress he held posts of finance minister, foreign minister, defence minister, leader of Lok Sabha, Rajya Sabha, deputy chairman of Planning Commission in Congress governments. Of course, all this would not have possible without the patronage of the Gandhi clan. He got it mainly for being a turncoat who defected to the Hindutva ideology. RSS/BJP rulers miss no opportunity to declare Congress rule as period of misfortune, loot and corruption are sponsoring this old Congressman. He is welcome as he was a ‘good Congressman’ since he kept quite when Sikhs were massacred in 1984, remained silent when Muslims, Christians and Dalits suffered regular cleansing campaigns by the Hindutva gangs, stood for neo-liberal policies (in fact, a prime ideologue of globalization). What got him recognition as the gem of India by the RSS/BJP rulers was his joining RSS. To make it public, he participated as a chief guest in a major RSS event at latter’s headquarters (Resham Bagh, June 7, 2018) attended by Mohan Bhagwat and top brass of RSS. He declared “Today I came here to pay my respect and homage to a great son of Mother India”. He was referring to KB Hedgewar, founder of RSS. Shockingly, this ‘great son of mother India’ founded RSS in 1925 to oppose the united freedom struggle for an inclusive India. He did not join the freedom struggle because it was being fought for an all-inclusive India and not a Hindu State. He declared minorities, specially Muslims the enemy of India and not the British rulers. He was a diehard Casteist. He was inimical towards the Tricolour which had become a National Flag for resistance to the British 1930 onward. His Hindutva icon VD Savarkar led Hindu Mahasabha ran coalition governments with the Muslim League in 1942 in Bengal, Sind and NWFP when Congress was banned, the country had become a jail and hundreds of patriotic Indians were being ruthlessly massacred for daring to carry the Tricolour or unfurl it at house tops. Hedgewar believed in Hindu nationalism as opposed to Indian nationalism. It was for such ‘contributions’ that Pranab da was praised by the PM Modi as one whose “wisdom and intellect have few parallels”. Another important factor could be Pranab’s long association with Ambanis who are very close to RSS/BJP rulers, specially PM Modi. During Congress rule former President of India was a link between Congress governments and the Ambanis. This linkage can be seen in a recent photograph snapped on the occasion of marriage of the daughter of Anil Ambani, brother of Mukesh Ambani. The posture of Anil makes it crystal clear; who patronizes whom. [ii]Balraj Madhok, Zindagi Ka Safar—3: Deen Dayal Upadhyay Ki Hatya Se Indira Gandhi Ki Hatya Tak [Journey of Life—3: From the Murder of Deen Dayal Upadhyay to the Murder of Indira Gandhi], pp. 22-23. [iv] H. V. Seshadri (ed. ), Dr.. Hedgewar, the Epoch-Maker: A Biography, 61.